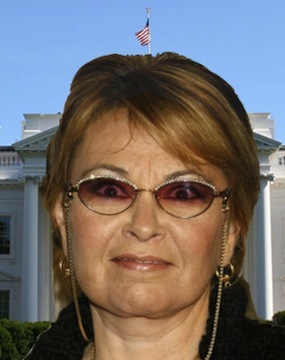 Roseanne Barr Is Officially Running For President! And what in the hell is the Green Party? Hippies, of course. “Grassroots Democracy.” They focus on equality, you know, free love. And hopefully they’ll be nuts involved. Free macadamia nuts for all who put a check mark by her name. I’m all for this. I doubt she’ll do a better job than Obama but I’d like to see a CHANGE, since that is the apparent solution to everything. Roseanne’s abrasive voice and in-your-face attitude is just the thing. It’ll be nice to see a real man in the White House, after four years under the rule of a backpedaling woman.